Electro-Matic Products, Inc. is a Metro Detroit, Michigan-based technology company dedicated to “Turning innovation into value” for their customers. Founded in 1969, they have expanded from a manufacturing automation supplier to embrace and pioneer emerging technologies. Their business ventures range from manufacturing and automation equipment to LED lighting and sign manufacturing. 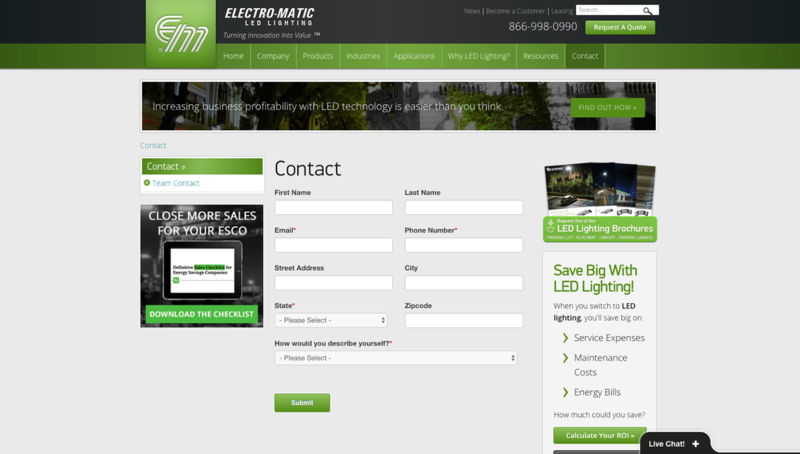 Electro-Matic will be the first to tell you that a great web presence is a must for any sign and advertising business. They first came to us with this goal for their Visual Products business, which manufactures, distributes, and sells electronic signs. But with three distinct business units under one corporate entity, they have many web assets to keep in sync. 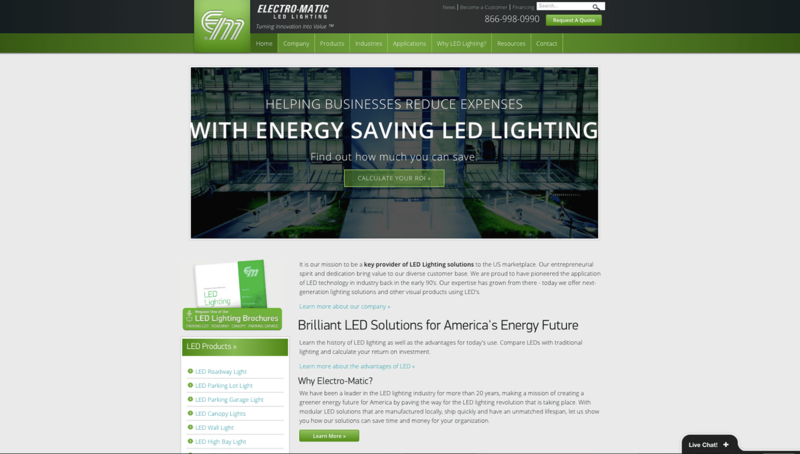 Not only does Electro-Matic need a great web presence aesthetically, but they also understand the importance of ROI when it comes to marketing. They needed a partner to help them increase website traffic, generate more leads, and engage with those leads to turn them into customers. Over the past 9 years, Web Ascender has worked with Electro-Matic to provide strategy and direction for each of their businesses when it comes to website experience, search engine optimization, and online marketing strategy. We work with them using a Growth Driven Development approach to continually identify areas for growth, implement improvements, test, report and repeat. We also work with Electro-Matic to develop ongoing campaigns for specific businesses and initiatives to generate targeted leads and nurture them into customers. Lead generation is a priority for Electro-Matic. Keeping this in mind, we worked with them to create specific personas of their ideal customers and then craft comprehensive campaigns to attract those type of people to the website through organic search, paid search ads, email campaigns and social media. We then developed calls to action on the website and conversion-focused landing pages to turn those visitors into leads. Finally, we set up automated email series to continually hit those leads and funnel them through the buying process. We also created custom notifications and lead scoring so their sales team knows where to spend their time to have the biggest impact. And we continue repeating this process to never stop building and improving their online presence. We have created 8 websites (and counting!) for Electro-Matic over the years. With each creation, our brilliant user-experience and design team works with Electro-Matic to figure out their goals, how the site will be used, and what they want visitors to do. We then develop the site architecture, outline where all the elements on the website will go, add some “paint,” and build out the site. We also have a proven process we go through with every site launch to make sure search engines are happy, proper reporting is in place, leads are being captured, and nothing is else is missed. We also use a content management system for every site, so when it’s time for a fresh look, we don’t have to create anything from scratch. We use the existing content and layout and put some new styles to update the feel of the site. 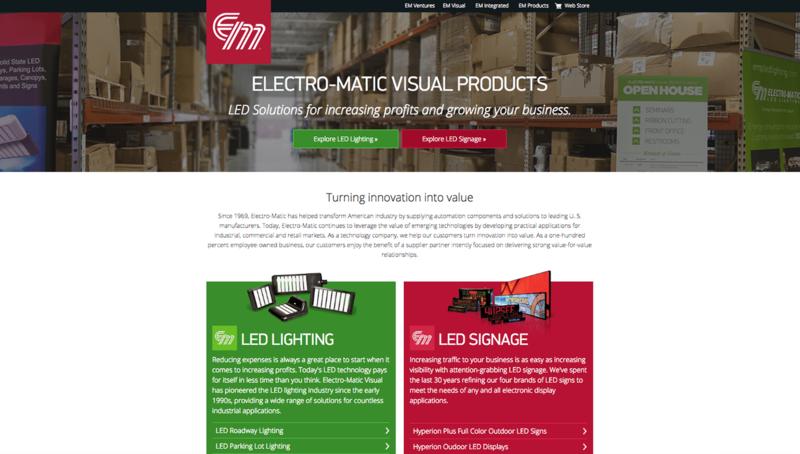 In addition to internet marketing strategy and lead generation, we also work with Electro-Matic to continually improve the overall user experience of their web properties. This includes identifying areas that offer the most potential for having the biggest impact on their business and putting a plan in place to implement, test and optimize them. We are constantly putting our creative geniuses to work to dream up brilliant ideas for Electro-Matic. We’ve created ROI calculators for the LED lighting and LED sign products, custom maps of their lighting and sign installations, and an interactive sign builder, just to name a few.